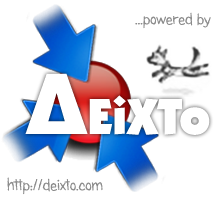 We recently built (and made freely available) an RSS feed for the Greek e-procurement platform. Today (just a few days later!) we were informed about the first (heavy!) user of it: UltraCl@rity (or ΥπερΔιαύγεια in Greek). UltraCl@rity is a search engine indexing all the documents published through the Cl@rity project (Διαύγεια – Greek Open Government Data). It was created because Cl@rity (and now eprocurement.gov.gr as well) do not provide adequate search functions despite the fact that they are both a great start towards transparency in public expenditure. 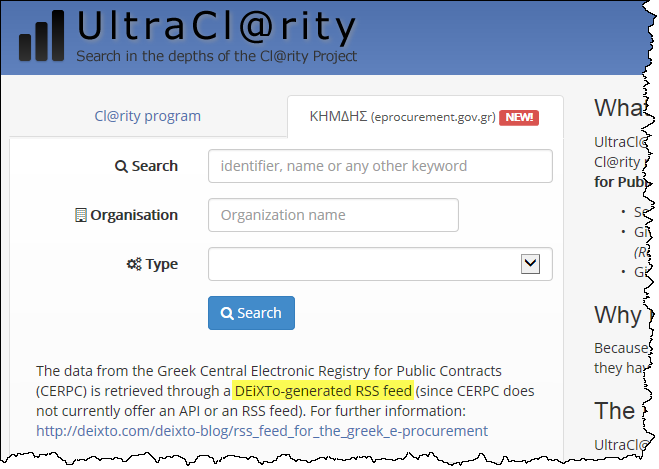 Using the DEiXTo generated RSS feed for the tenders published on the Greek e-procurement platform, UltraCl@rity now provides full text search on this data as well. This entry was posted in News and tagged e-procurement, RSS, UltraCl@rity. Bookmark the permalink.